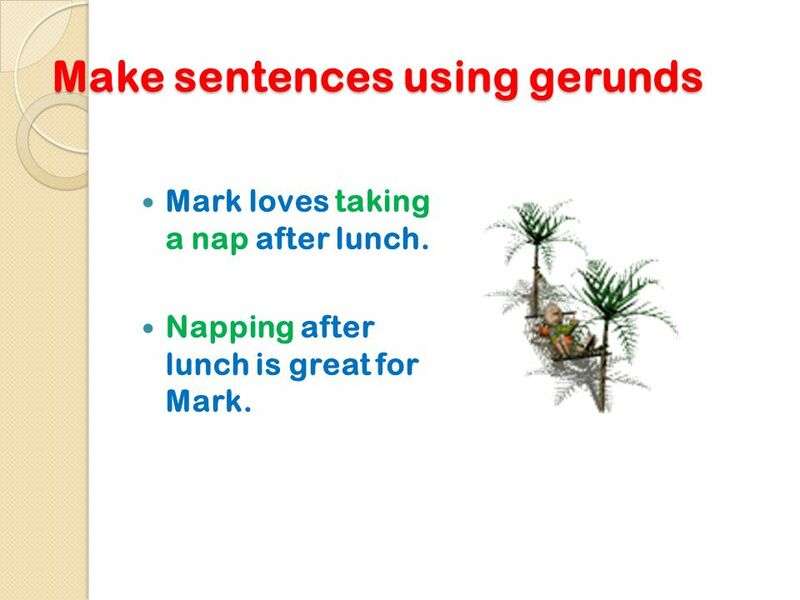 SENIOR 4 GERUNDS OR NOUNS. 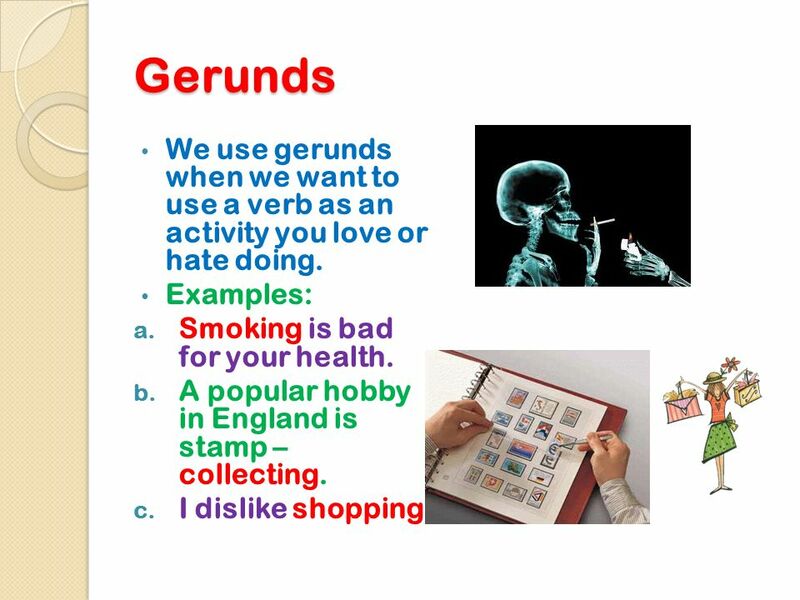 8 Gerunds We use gerunds when we want to use a verb as an activity you love or hate doing. 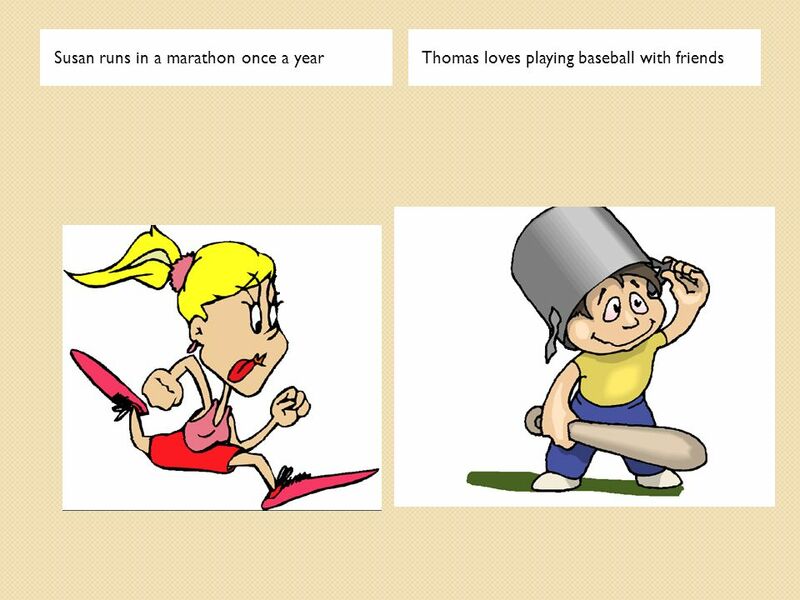 Examples: Smoking is bad for your health. A popular hobby in England is stamp – collecting. I dislike shopping. 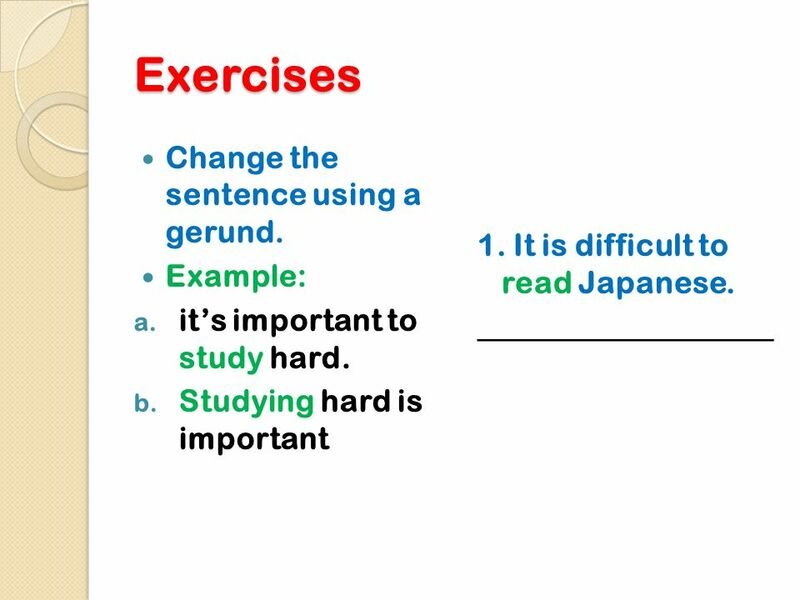 10 Exercises Change the sentence using a gerund. Mark loves taking a nap after lunch. Napping after lunch is great for Mark. 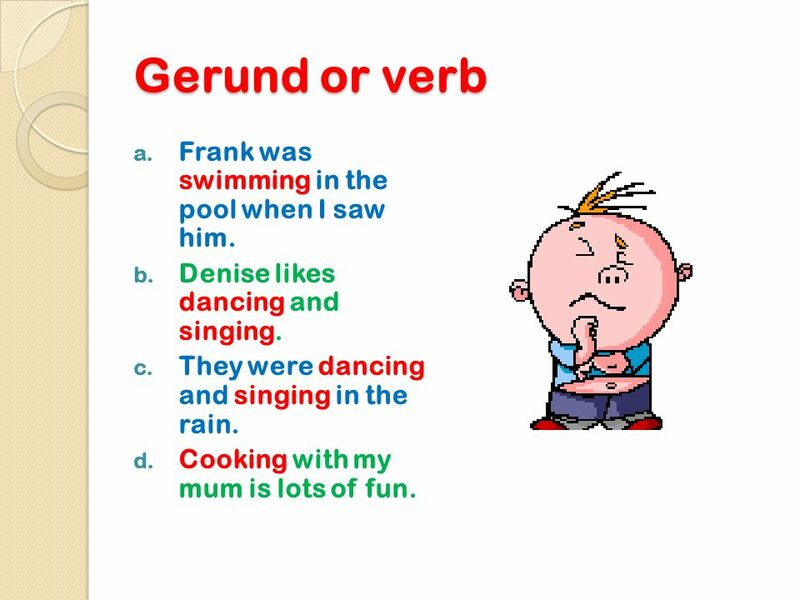 19 Gerund or verb Frank was swimming in the pool when I saw him. 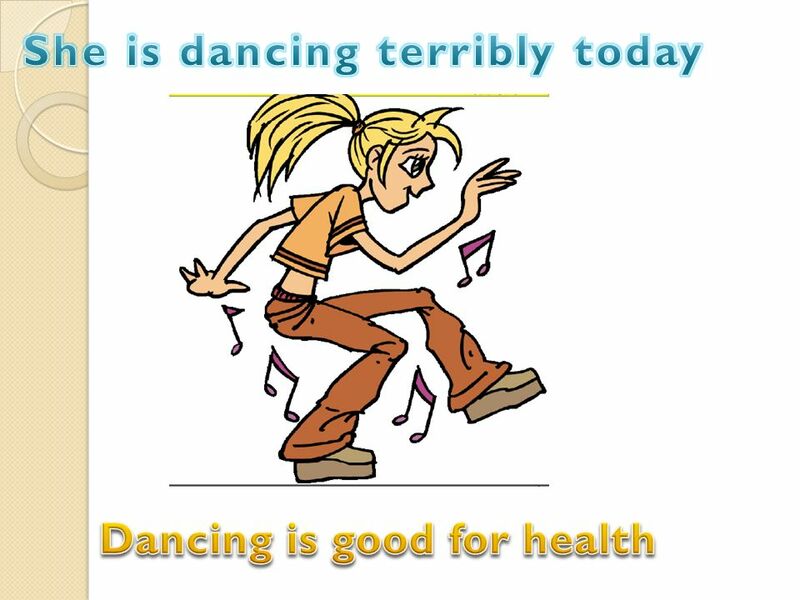 Denise likes dancing and singing. They were dancing and singing in the rain. Cooking with my mum is lots of fun. 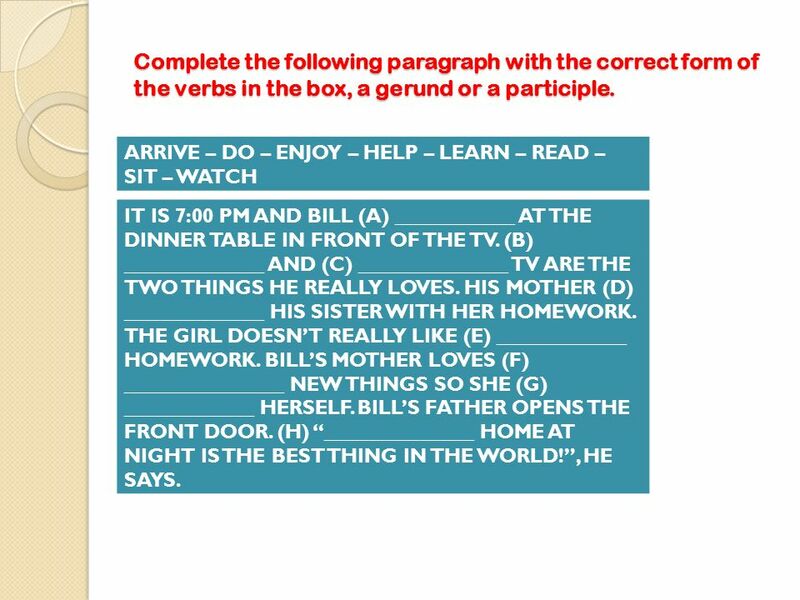 20 Complete the following paragraph with the correct form of the verbs in the box, a gerund or a participle. 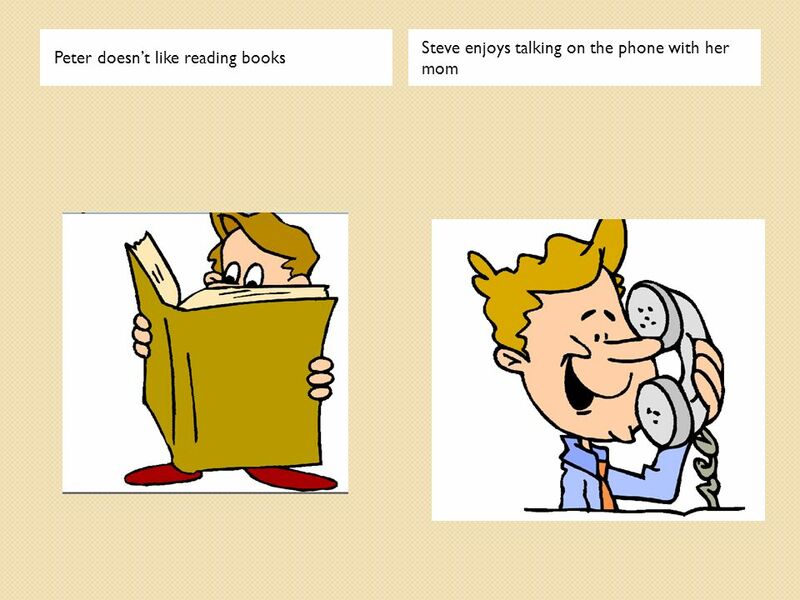 ARRIVE – DO – ENJOY – HELP – LEARN – READ – SIT – WATCH IT IS 7:00 PM AND BILL (A) ____________ AT THE DINNER TABLE IN FRONT OF THE TV. 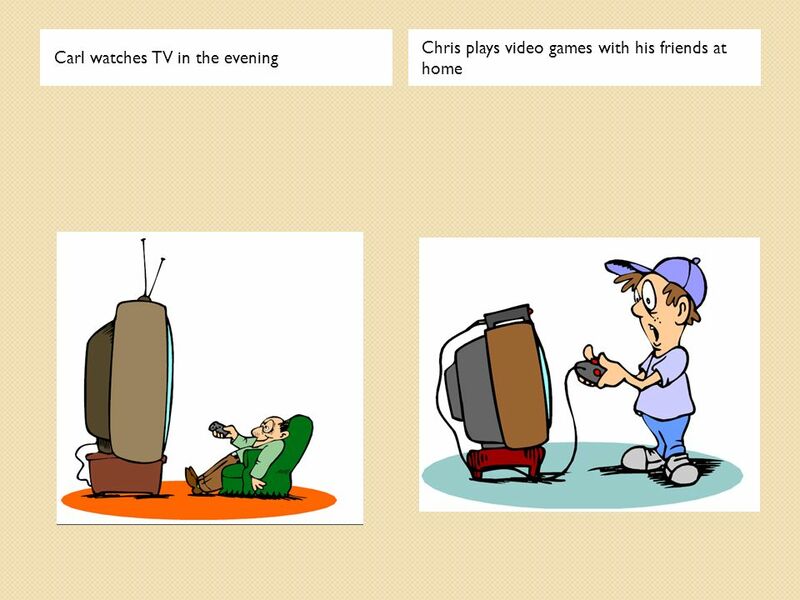 (B) ______________ AND (C) _______________ TV ARE THE TWO THINGS HE REALLY LOVES. HIS MOTHER (D) ______________ HIS SISTER WITH HER HOMEWORK. 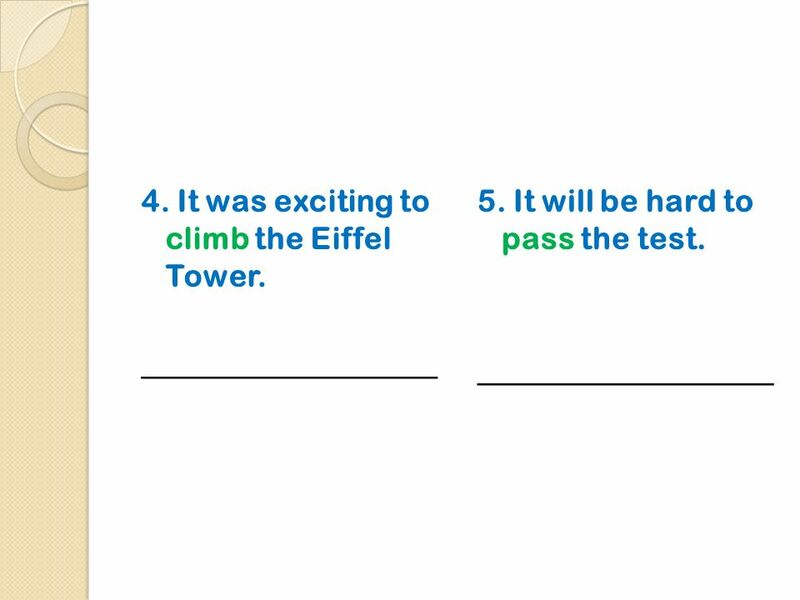 THE GIRL DOESN’T REALLY LIKE (E) _____________ HOMEWORK. BILL’S MOTHER LOVES (F) ________________ NEW THINGS SO SHE (G) _____________ HERSELF. BILL’S FATHER OPENS THE FRONT DOOR. (H) “_______________ HOME AT NIGHT IS THE BEST THING IN THE WORLD!”, HE SAYS. 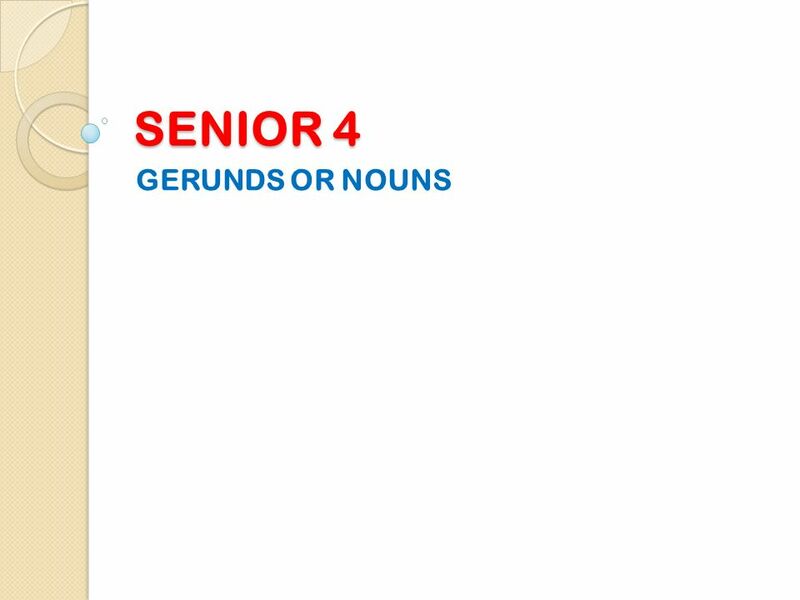 Download ppt "SENIOR 4 GERUNDS OR NOUNS." 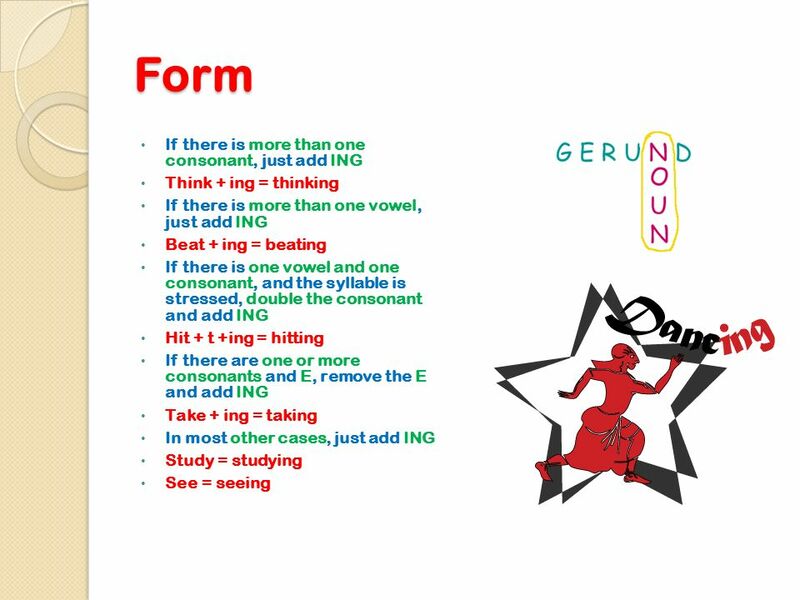 Take a closer look… They are not verbs… Verbals are imposter verbs!! Iam youare He / She / Itis weare youare Theyare. Автор: учитель английского языка Немцова Юлия Сергеевна МОУ «Таврическая СОШ №1» р.п. Таврическое, Омской области. What did they do last Sunday? 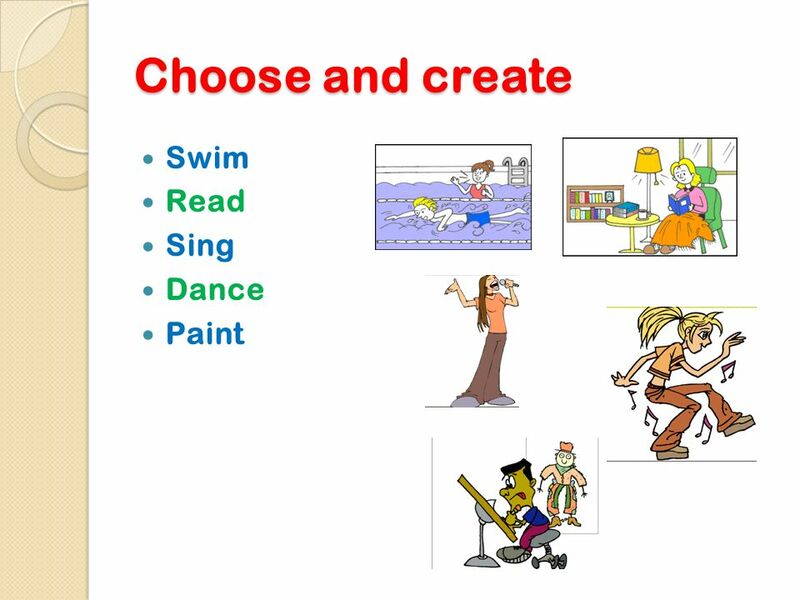 Present Continuous (Progressive). The cat is sleeping. The kitten is playing. The dog and the kitten are running. now. 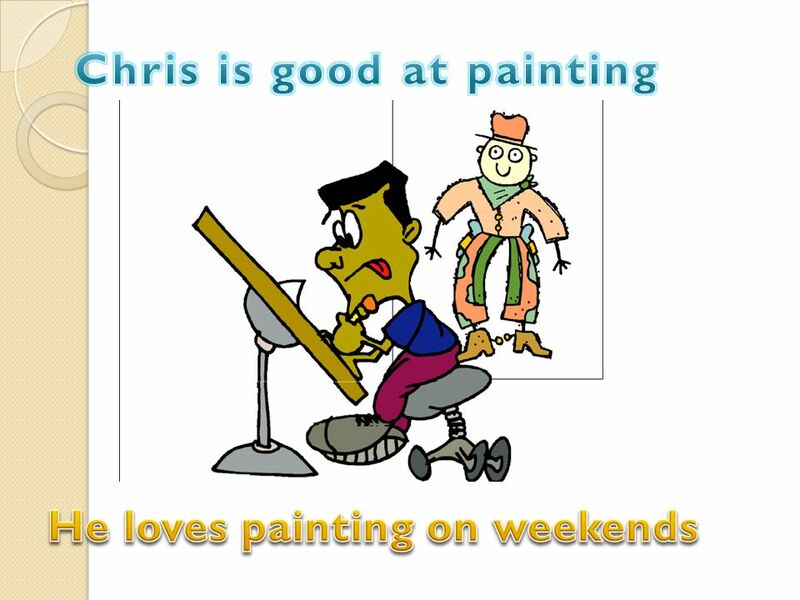 Present Continuous (I am doing) Richard Ortega. 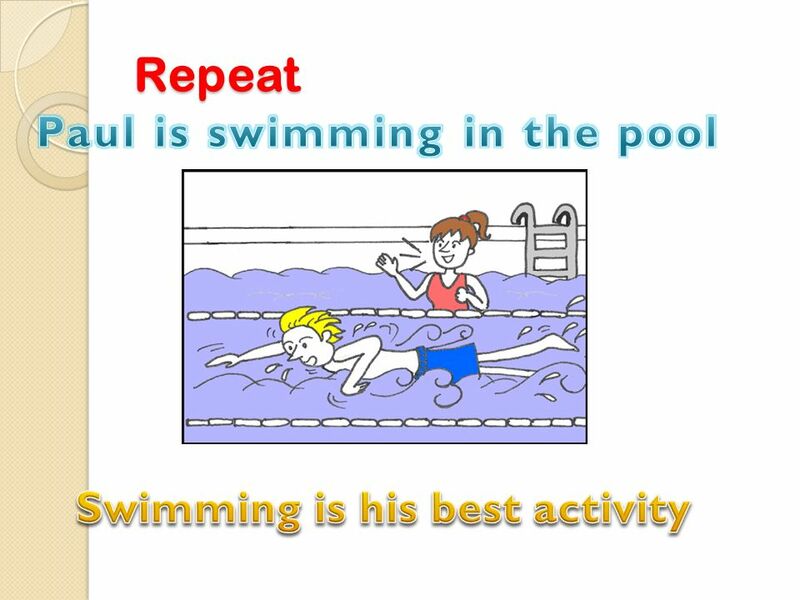 Present continuous The present simple tells what a person does, is or feels. 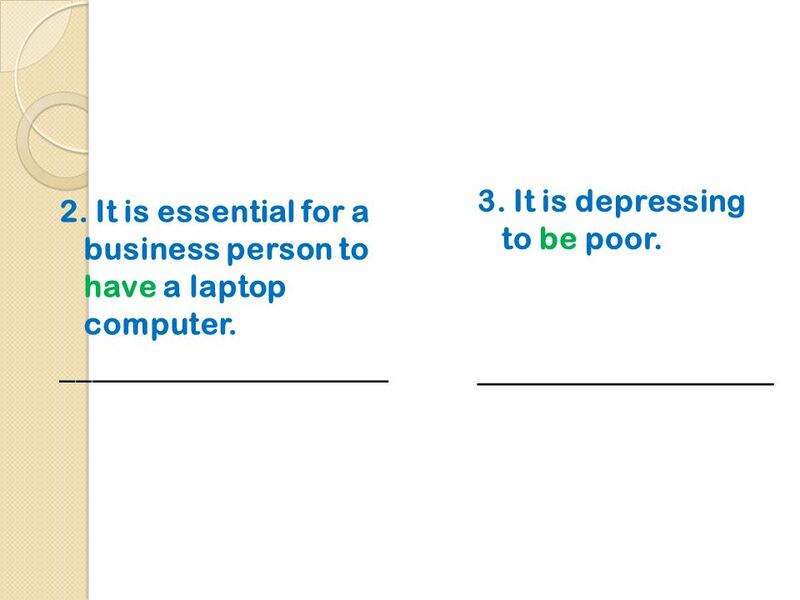 The present continuous describes. 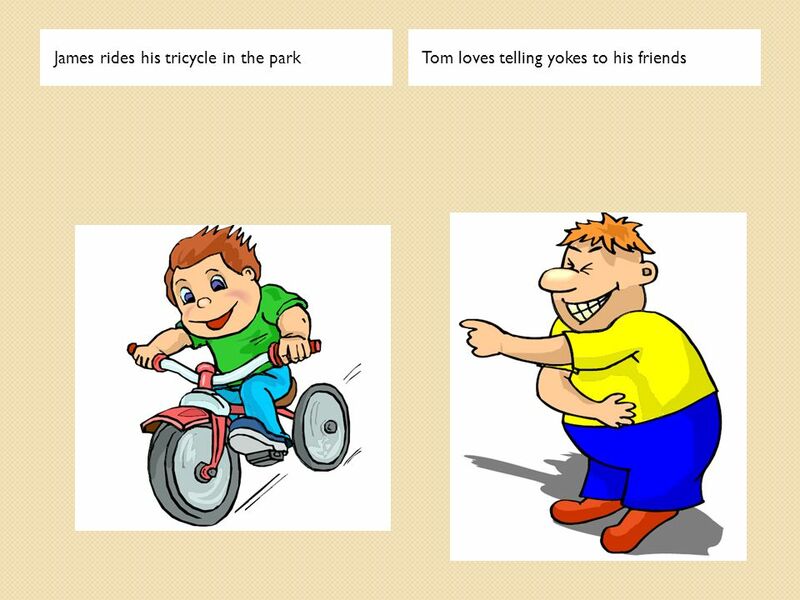 Present Simple & Present Continuous 1. 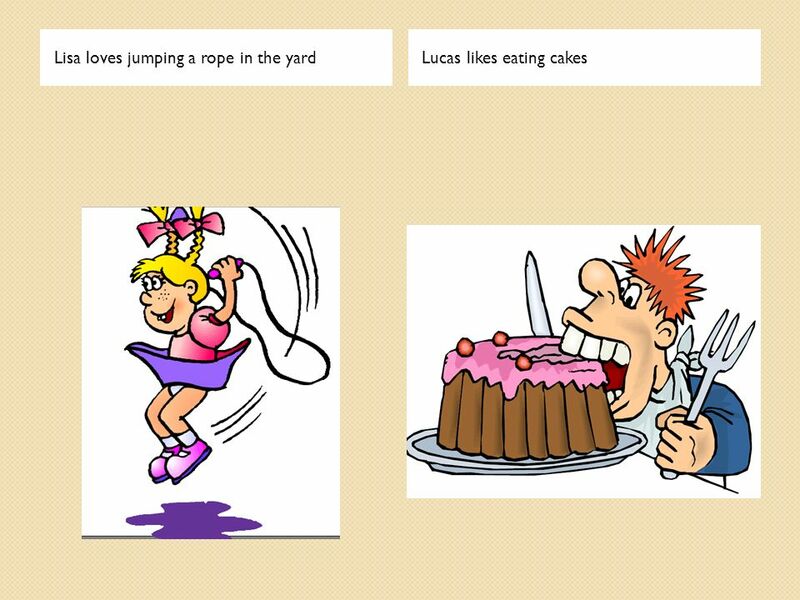 Present Simple 2.